Pirates Dinner Adventure is located in Buena Park, California. If you did not know they are very accommodating when it come to food allergies and dietary restrictions. They want all their guests to have a pleasant and safe dining experience while enjoying the show. Buena Park is a short 15 minute drive which is approximately 6 miles from the Disneyland Resort area. Disclosure: I received my meal complimentary as part of the AWEsome Retreat Conference. After you enter the vicinity you are greeted with snacks and a photo op. Honestly I wasn't sure if the snacks were safe so I did not eat them. It is suggested to arrive an hour before the show, but you may arrive as early as 90 minutes before the show. You are given a ticket with your section color and table number, very important not to loose this! And remember your color because you will need that information! There are lots of things to look at on the walls and in the different rooms while you are waiting to be called to your seat (standing room only while you wait). 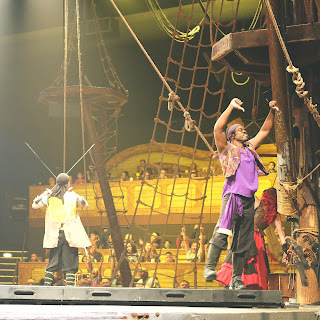 As it gets closer to the showtime the pirates for each "team" will come out to gather you based on the color called. 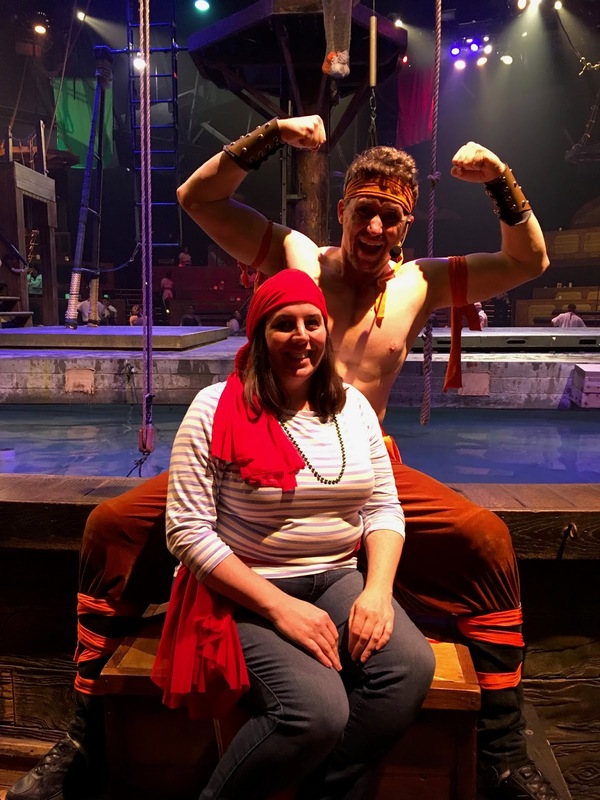 For example, I was on the Orange Team and our pirate came out and was calling for everyone in the orange group to follow him! After we arrived at our section (which is actually long row of tables in stadium like setting) our server came over to take our drink order; that was when I made sure to let her know I was gluten free. She let me know what my options were and that for dessert instead of the brownie I had the option to choice one of two different flavors slushy. 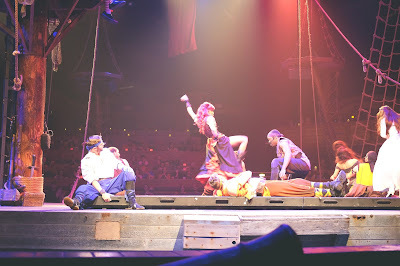 The show was phenomenal, all the Pirates are in full costume and every seat has a great view of the show. I felt as if I was right there on a Pirate ship. The pirates are very interactive with their singing, dancing and playful ways. They come right up to your table to talk with you and make you part of the show, but watch out they might just ask for a bite of your food! For my gluten free meal I had the option of either soup or salad (I chose salad with ranch dressing). 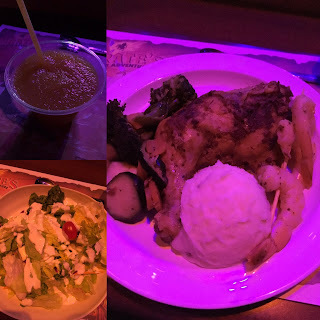 The entree is roasted chicken, mashed potatoes, shrimp and veggies. On the website they don't mention the shrimp as part of the gluten free choice but my I verified with my server and I was told my plate was gluten free. I ate everything up, it was so delicious and so much food I was stuffed. The chicken was cooked perfectly and not dried out at all. 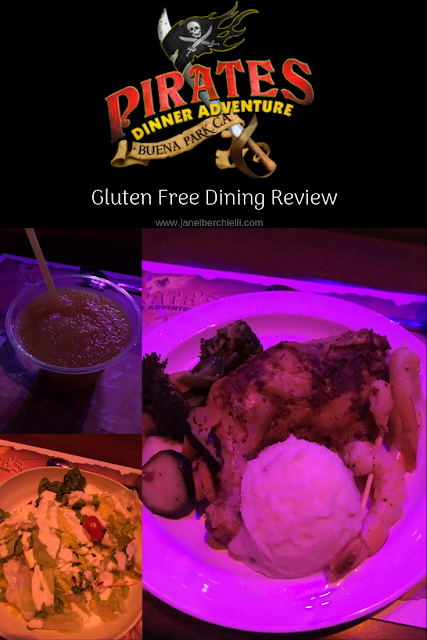 I would highly recommend a visit to the Pirates Dinner Adventure in Buena Park, California. Prices vary based on your added on experiences but the general base price is starting at $61.95 for adults and $36.95 for children (ages 3-11 yrs). If you are going to splurge on one thing during your vacation the Pirates Dinner Adventure is definitely my recommendation! I think I prefer this dining experience over ANY character dining at Disneyland. 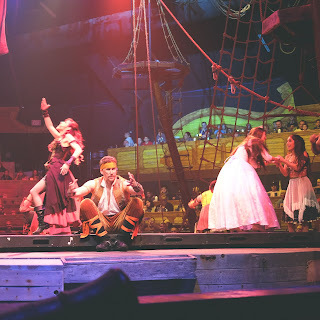 The food, the show and the Pirate atmosphere is worth every memory I made during this experience. The Pirates Dinner Adventure has a variety of show options based on different times of the year so even going more than once you will experience a something different. 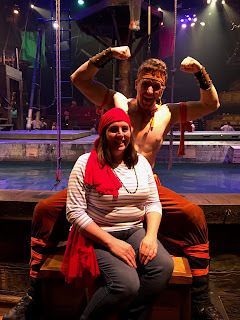 Next time I am in town I will definitely be coming back to the Pirates Dinner Adventure and bringing my family with me!